Heat up some oil in a wok over medium high heat. Add the garlic and onions and sauté until fragrant. Add the taucu and sauté for another minute. 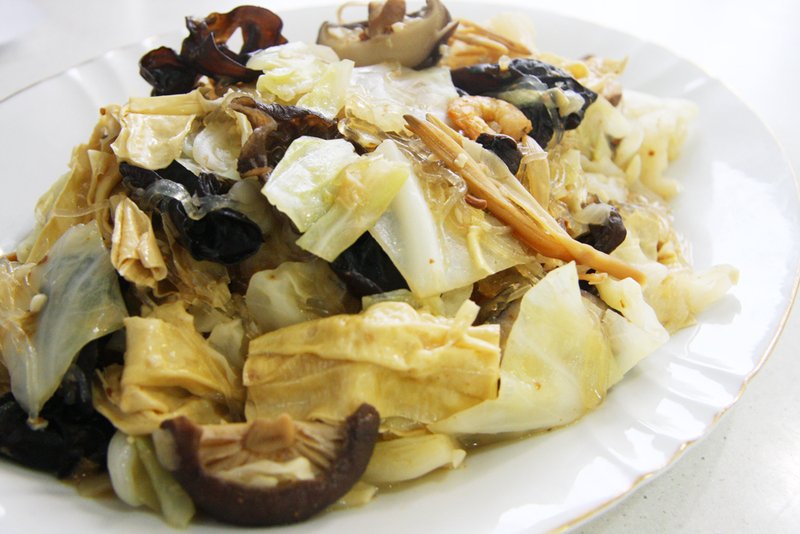 Add the chopped cabbage and continue cooking until the cabbage becomes soft. Add the other ingredients to the wok except the glass noodles. If the ingredients had to be soaked, toss them into the wok together with the soaking liquid, then top up with enough water to cover all the ingredients. Bring to a boil then cover the wok with a lid. Let it simmer for about 10 minutes. Check the vegetables to see if they are done. When they are, add the glass noodles and mix well. Let it stew simmer uncovered until the sauce reduces, but make sure not to let the sauce completely dry up. Season with salt and pepper and serve with steamed white rice. Malaysian influence with Peranakan culture resulted in the birth of 'Nyonya' foods.